I just finished cataloging my comic book collection and found that I bought two copies of DC's Blackest Night Flash #1. I didn't know what to do with it so I thought I'd give it away to one lucky reader. So if you want to have it check the break to see how you can have this good read sent right to your door step for free. I'm really not sure how many of you would want an old issue but hey if somebody wants it I'd be glad to give it to 'em. So here's all you have to do. Leave a comment below telling us what you're geeky about and why. Contest is open to anyone in the Philippines. Sorry, we don't think shipping and taxes would play nice with us. Winner will be chosen based on creativity of answer. Entries can be submitted until Sunday, February 28th at 12 midnight Philippine time. Facebook users please leave a comment HERE and NOT on the fan page. So what are you waiting for? Let the world know your geeky side! 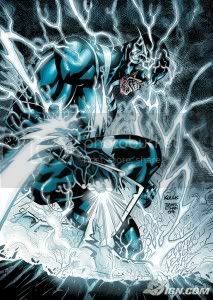 I'm crazy about Blackest Night! I actually wasn't expecting to be hooked since I'm more of a Marvel fan than a DC dude. Plus I thought the concept of multi-colored lanterns battling zombies was too campy. Yet Geoff Johns made me instantly change my mind right after giving the first issue a chance! Haha! I am a geek for comics especially Blackest Night. I'm geeky about any action figure with 30+ articulation points, I'm geeky about Alexan Robot Kits, I used to be geeky about comic books (maxx #1), I'm currently geeky about Thomas and friends Plarail Set, I'm geeky about Monster Hunter (PSP) I'm geeky about all of this because i wanna stay young at heart (i'm 34 yrs old) and i wanna share this fun geeky stuff to my 3 year old son. Im geeky about knowledge and contest around the world. been a fan of green lantern since grade school, now in my 40's i had to stop collecting comics, because my priority now are my family and daughters. would really like to win that comic. thanks and more power. I'm a geek at comics, I haven't seen this one yet since my choice and budget for comics is very limited, but once I get a hold of a comic book I choose one frame or a scene, get a sketch of it and re-sketch it onto a blank canvas and oil paint the scene. I love making the colors change, I once oil painted an old Superman Comic book scene where Superman was carrying a volt door and his costume looked like what ballerinas would wear but in red of course, I changed the color to pink, and voila, instant pop art...a friend really liked it so I gave it to her as a gift. I'm a friggin geek. I freaking cried and went in a rage after Ondoy destroyed some, thank God not all, my comics. Most of them we're Issue Number ones in the late 80's and early 90's. &^%$#%$#$. Pardon the language. Imagine! My four-gate-fold X-men #1, friggin went to the Norse God Heaven because of &^%#@@! Ondoy!